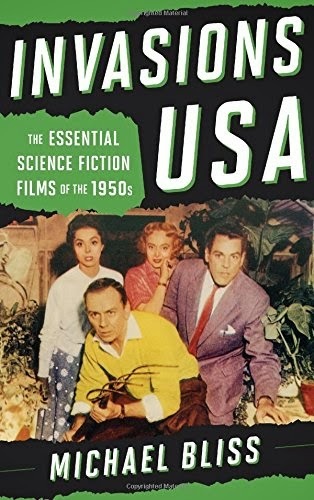 It’s important to point-out that this book’s subtitle is somewhat misleading, making it sound like a reference guide to an era when science fiction cinema came unto its own as a legitimate film genre. This book is not a guide, but a critical analysis of only 11 films which (consciously or unconsciously) exploited American paranoia, metaphorically criticized its jingoism & culture, or had us questioning our own values. Invasions USA reads like a masters thesis. Author Michael Bliss approaches each film as though its creators had a much loftier ambitions than providing popcorn entertainment. He’s both critical and complementary of, not only the effectiveness of these films as metaphors, but the agendas of the filmmakers themselves. For example, Bliss has no love for the work of producer George Pal during this decade, delving into his upbringing to suggest his Christianity rendered classics like When Worlds Collide and War of the Worlds exercises in Puritanism. On the other end of the spectrum, Bliss praises The Day the Earth Stood Still, not only for its storytelling, but its sobering condemnation of humankind and its unwillingness to change, even when faced with annihilation. Whether or not the reader agrees with Bliss’ assertions, Invasions USA is a pretty good read, especially if you’ve seen the films he’s chosen to discuss. However, considering the price, this is a pretty slim volume (167 pages, with 40 of those comprising citations, bibliography and the index).